His lawyer, Ms Finelle, said for some of that time he hadn't had access to his case file or an opportunity to contest his detention - a victim of Japan's "hostage justice system". "He is basically treated in a way that's he's pressurised - to weaken him so that he will make forced confessions," she said. Mrs Ghosn later told media outlets she felt "in danger" and had decided to return to France to ask the French government for support. 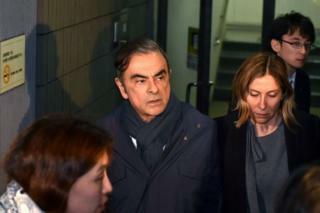 Mrs Ghosn also told newspapers that before his latest arrest her husband had recorded a video detailing who he believes is responsible for what has happened to him. Mr Ghosn's legal team in Japan is expected to release the video on Tuesday. He has previously said his arrest was the result of a "plot and treason" against him - a bid by some Nissan executives wanting to stop his plan to integrate Renault, Nissan and Mitsubishi. Ms Finelle said last week's arrest appeared timed to prevent Mr Ghosn from speaking to the media after he announced his intention to publicly present his side of the story.